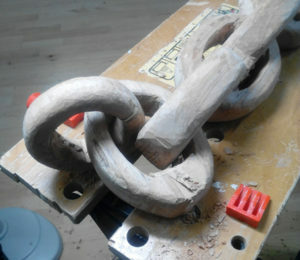 We resume work on my wooden chain with the difficult process of freeing up the individual elements. In the first picture above you can see the hook end with most of the material removed. 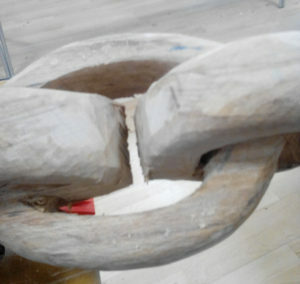 All that is left is the tricky bit, removing the wood in the tight gap joining the hook to the next link. The first part to remove is here in the second picture, and easy to get at. The third picture shows the result of another hour’s work, nibbling away at the wood between links and freeing them up. For the first time we have completely separate pieces of wood, linked together. It now becomes a somewhat repetitive task, working along the links, freeing them from each other. At this point they are far from finished. A lot of work still needs to be done to even up the chain shapes. This is the point where I leave it for now. All the links are free, but in need of a few more days work to finish them off. Time I don’t have right now as I have work to do to prepare for a blacksmith experience day this weekend. I can also explain the first question posed, about making a single piece of wood longer than you started. 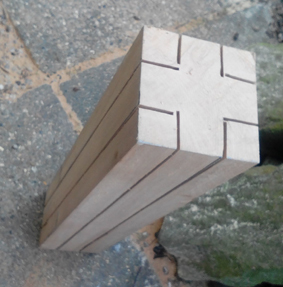 The links as drawn on the original piece needed gaps between them to allow a chisel in. 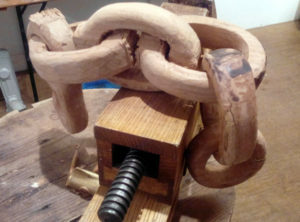 By the time the links are thinned out and finished off they will stretch out further and so the chain will still be make from a single piece, but will be longer than the original block it is made from. 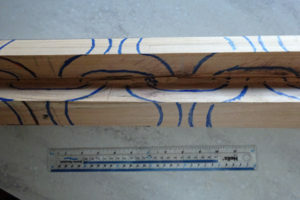 How do you make a piece of wood longer? It is a question I was asked the other day, and the answer is simple, you make it into a carved wooden chain. Stick with me and you will see how. 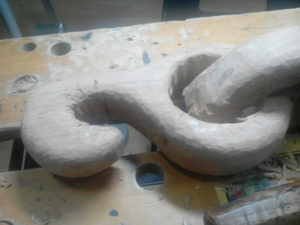 It is an exercise I haven’t tried before and so I began it during a wood carving weekend with the help of a very good teacher. As with many things I do, I wanted it to be big. This meant starting off with a piece of spalted beech about 10cm square and 60 cm long. This is a close grained hard wood, difficult to carve but with a lovely finish when done. What I wanted to produce was a 4 link chain, started with a simple loop and finished with a hook. The process begins by cutting the wood into a cross shape. If you think about looking at a chain end on, with the links at right angles to each other, then you will see the shape needed. The next stage is to mark out the chain pieces as they cross each other. The most important thing at this point is to make sure that you have left enough space between the drawn links to get a chisel in between. This allows you to cut out the wood to free the links from each other. Hopefully the above pictures help explain. Now comes the easiest part. Cutting away the waste material. Providing you can see the final chain outline in your mind, and have drawn it clearly, then it is a simple process to cut away the waste. Hopefully you can see the chain shape appearing. At this point you have to start clearing out the material from within the loops of the chain shape. The first bits can be drilled out. After that it is back to the chisels. 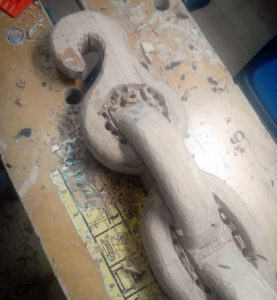 The most difficult part is removing the wood from inside the loops, taking care whilst shaping one area to not remove wood needed by a neighbouring link.